Here?s a delicious and easy-to-make raw cookie recipe that?s completely vegan. 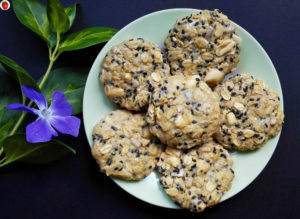 Raw cookies may sound weird, but they taste amazing! You can call them bars if you prefer. By the way, this recipe is similar to my raw vegan granola bar recipe. The base of my cookies is oat flour. I also added some rolled oats, desiccated coconut, black sesame seeds, and chopped almonds and peanuts. You can use any type of nuts or seeds. You?ll need some coconut oil and some nut butter too (I used tahini). The sweetener I used was maple syrup, but you can use any liquid sweetener you may have ? agave nectar, honey (if you are not vegan), etc. If you want, you can add chocolate chips or dried fruit. Mix the maple syrup with coconut oil and tahini.